The Running Therapist. : Cross country season Is here! Cross country season Is here! I hope every one is feeling as good as I am these days. Last year I had a horrible entry into the fall season due mostly to a plague of sickness that hung on up to mid December. This year I am stocked up with nutrients and am watching my health like a hawk! I am determined to have a strong off season with plenty of quality workouts and lots of cross country skiing. I got my job back at Sigge's on West 4th and Arbutus this season so I will devote more time into reforming my technique to become a better and more efficient skate skier. I'm certain there will be a few loppets and perhaps even one of the 50k ski races. I'm so excited for the cool rainy weather and the snow!! I can't wait for this time of year and no longer have to because it's definitely here. I will enjoy slipping into a new pair of running tights when it gets colder or even just the long sleeve shirt with a reflective vest. Don't forget to brighten up your outfits now that our sunsets are so much earlier and sunrises later. Last weekend was the first race of the 2010 Lower Mainland Cross Country Series. The venue for this year's Pine Tree Classic was Mundy Park in Coquitlam. I had never been to Mundy Park before so I was excited to be running on some new trails. I was car pooling with a couple of my team mates from Vancouver which is always nice because I just sit back and enjoy my pre race goodies. For me this is usually something like a Lara or Cliff Bar and my Vega Sport drink. If I'm feeling like I need a bit more, I'll have some greens powder with orange juice and some Vega Sport. BAM!! Talk about fuel for the fire. This mix actually puts out the fire and allows for quicker recovery during workouts. I was able to have some organic oats, flax and pumpkin seed oatmeal as the race didn't start until 10am. I have been forcing myself to eat at early times which I am not used to before my long runs and races in order to prepare for the marathon. I'd like to have fuel in the tank before the run. I have been experimenting with different types of foods and the sustained energie they give me for training and living optimally. The above mentioned items have all faired well with my sensitive digestive system. (especially during intense workouts) As for fluids, I usually start my day with a large glass of water (at times with fresh lemon) I have been able to avoid coffee lately until noon. But the MonaVie EMV about 45 mins before any activity and some Vega Sport if I'm going the distance or need some extra boosters. I know this doesn't seem like much on the day of, but I prepare my body days in advance of an event by loading it up with essential nutrients. That way, I don't waist my energy on race day by trying to digest all of what I need while I'm running. It will be in storage and I can call upon it when I need it. So let's get back to the race here. It's raining cats and dogs when we arrive. We get registered and get our race numbers and prepare for warm up to commence in about a half hour. It's always nice to mingle pre race with all the other runners. I knew that VFAC would have a strong presence today but I had no I dea we would be as strong as we were. I have yet to get any results from Phoenix running club, but I will update more specifically later on the VFAC website. We had a lot of men out to make up a solid fast blue train and The two women that did show up did very well! It was an interesting start. there was a lot of bumping and elbows flying. I was getting trapped inside a pack when I decided I had to make a move. At the same time all of this was happening, I had to reset my watch because I hadn't cleared my last workout off the screen and restart it. I figure this took at least ten seconds for me to reset my watch. By that time, the pack was one third of the way around the beginning lap of the soccer field. I surged hard and pushed my way around the outside towards the heels of Kevin and Tristan who had just made their way out of the pack. I could hear Drew right over my Right shoulder. There was a young UBC runner who managed to keep the pace up for the first km or so. As we approached the deeper part of the forest, Tristan and Kevin surged again and I went with them. 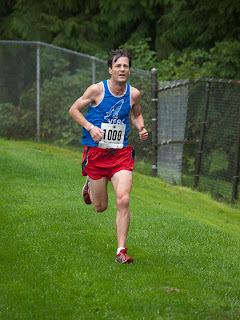 I shoved past the young UBC runner and felt no response from him or Drew. I focused my eyes over the shoulder of Kev and dug in to hold on to their forward momentum. I pretended I was at practice and just tried to relax into my groove. The ground underfoot was very soft and forgiving for the most part. I did not know what the course had in store and was certain that there must be at least one bugger of a hill for us to scramble our way up. I did know that there were two loops, so whatever I did encounter, I could look forward to doing twice. I recall approaching the top of a large downhill and thinking "Here we go!". I could see Tristan and Kevin take flight ahead of me and knew I must implement my technique in order to keep up to them on this downhill. I resisted the temptation to slow myself down and and swooped down the hill after them. Regardless of what I do, I can always learn how to be more efficient on the down hills because this is where they broke away from me. Up ahead was the big hill of the loop. It was not too bad and I really enjoy hills. I'm going to be the hill master after this cross country race and ski season! I dug in and pushed through the hill until I was recovered. This took me a good while because of the pace those guys were pushing for the first lap. I was recovered before the second loop started and Could not see or hear anyone behind me. I knew I was safe, but I wanted to keep the pressure on the two leaders and keep them in my sight as best as I could because it was closer to catch them then it would be to get caught. There is always a chance that some one bonks and you may pass them in the last 100m and that's enough to keep me pushing the limit. Second lap was smooth and my breathing was deep. At times I realised how much I seemed to be hyperventilating, especially atop that hill. A few calming words and a few deep breathes get me back on track and running smoothly. I focus on form and technique during this lap as I've settled comfortably into a good pace. I am trying to lengthen my stride angle and lower my bounce. It seems to be helping me to go a bit faster but is definitely easier to practice on the road or the track. It was fun doing a hot lap coming into the finish, but the sharp corner before the loop is sketchy. I felt amazing in my last few kilometres and really seemed like I was just warming up. I'm sure that has to do with my marathon training. I came in third place and Kevin eventually caught up to and passed Tristan half way through the second lap on the big hill. Drew came in shortly after me to round out the open men's podium. There were so many strong finishes From the VFAC crew with about three people out sprinting their opponents within meters from the finish line. I can see the strength and speed training shining in all of them and I have watched everyone from my team improve so much this year. It's a great time for our team, everyone has worked very hard this season and look so healthy. I am confident we will have great potential in the team competition of the cross country series this year. I will not be able to be at any more of these races until after Victoria Marathon (Yaaay! only 16 Days left!!!) I will However be completing the mandatory 5 races in order to qualify for series points and prizing. Congrats to Theresa and Kevin the Master and overall winners of the day! Keep on running and you'll just get faster like these two!! Also a shout out to the only two VFAC ladies Emily and Rebecca. I hope that you two will have a lot more support out there at the next few races!! C'mon you girls, represent!!! Pep talk to follow this evening at practice! As for the rest of my world, there is still a lot on the go. I am moving on the 1st of October and have yet to find a place which suits me. I am optimistic still but if all else fails, will have to live with a friend until I can find something appropriate. Work has picked up for the season and I will be very busy this winter. The rain has started to fall and I am ready for this winter to be a productive time. That's about all I have in my writing repertoire for today. Check back for more exciting info and news as we get closer to the marathon times. On that note, one last shout out before I get ready for practice. Sending all those athletes especially Katherine Moore our best wishes for great performances in Toronto Marathon. Also Best wishes for a speedy recovery to Marilyn Arsenault who was training for this event and got injured. Things I hate: Renters looking for female room mates only. Are men that bad?? Things I love: Embracing the new seasons. Excellent writing David, I was on the edge of my seat wanting to know the outcome of the race. We don't really know exactly how racers feel during a race and the intensity of it but you described it very well. Thank you!